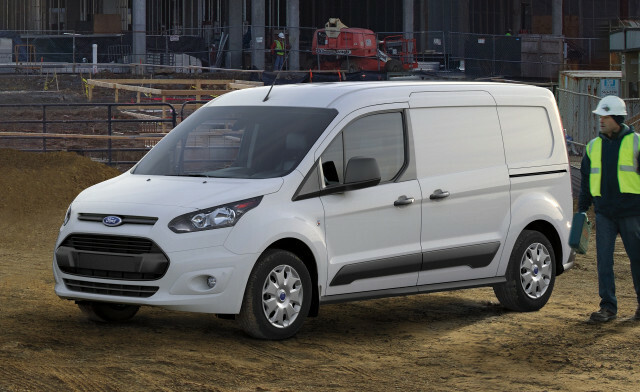 The Ford Transit Connect is really meant for smaller loads and urban usage; if you’re looking for a full-size van, you want its bigger brother, the Ford Transit van. The 2018 Ford Transit Connect is a practical, versatile small van, while its passenger version, the Wagon, is a smaller, perhaps smarter substitute for a full-size minivan. The 2018 Ford Transit Connect is a small commercial van used by countless small businesses to keep America stocked on flowers, drinks, candy, plumbing, sprinklers...you get the idea. A family version called the Transit Connect Wagon is offered in XL, XLT, and Titanium trim levels, while the commercial variants come in a dizzying variety of wheelbases, body heights, and configurations. Changes for 2018 are limited to some minor feature upgrades. Small businesses make up by far the bulk of Transit Connect sales, but families who want a sensible, flexible people carrier smaller than a seven-seat minivan should consider the Transit Connect Wagon. That passenger-oriented variant offers seating for five or seven, though space is clearly tighter than inside a full-size minivan. Still, it has the taller stance of a crossover (though no all-wheel drive) and its relative frugality makes a great alternative to heftier full-size vans. It’s far more fun to drive as well, and it may even avoid the stigma associated with the modern minivan. The first-generation Transit Connect, launched in 2010, was a car front with a box on the back. The current model is more graceful and more refined than its rivals, the Chevrolet City Express, Ram ProMaster City, and Nissan NV200, and scores higher in our ratings. The 2018 Ford Transit Connect blends a car-like front cabin with more appealing exterior styling than its competitors. The 2018 Ford Transit Connect is a considerably more appealing vehicle than its predecessor, whose styling dated back to 2002 and took “slab-sided” to a new pinnacle. Ford’s designers have done a good job with what is essentially a large box with a car-like front end, and we think it strikes the right balance between function and flair. The Transit Connect’s front cabin would be perfectly at home in its Focus compact or Fiesta subcompact, both designed in Europe, as was the van. The dash has a lot of buttons, but it’s modern, functional, and proves well-suited to tougher commercial use. The lines and style of the fittings in the rear of the Wagon version, however, betray its commercial origins around the edges. They’re functional but not particularly soothing. The 2018 Ford Transit Connect offers car-like driving and handling that’ll startle anyone expecting the little van to drive like, well, a van. 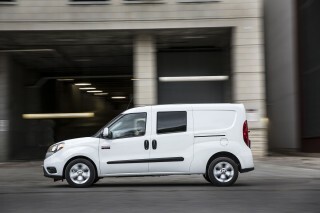 Both the Transit Connect vans and the Transit Connect Wagon passenger versions offer a single powertrain, a 169-horsepower 2.5-liter 4-cylinder engine mated to a 6-speed automatic transmission that drives the front wheels. (A 1.6-liter turbo-4 offered in previous years is no longer available.) It’s no speed demon, but you’ll keep up with traffic. The little van is built on underpinnings adapted from those used for the Focus compact sedan and hatchback, the C-Max tall wagon, and other Ford models. Those cars are known for generally responsive handling and nicely weighted steering, and for a small van, the Transit Connect delivers those qualities. In particular, the passenger wagon may be the nimblest and most sporty three-row vehicle we’ve driven. Fleet operators probably don’t care that much about handling and roadholding—cargo capacity and cost of operation matter there—but we’d suggest the Wagon, especially the lighter five-seat model on the shorter wheelbase, offers a unique mix of practicality and fairly enjoyable driving, even before you assess its space and carrying capability. The payload is a relatively modest 1,270 pounds, which falls considerably once you start adding passengers. The passenger-oriented Transit Connect Wagon can tow up to 2,000 pounds with an optional Tow Package fitted. 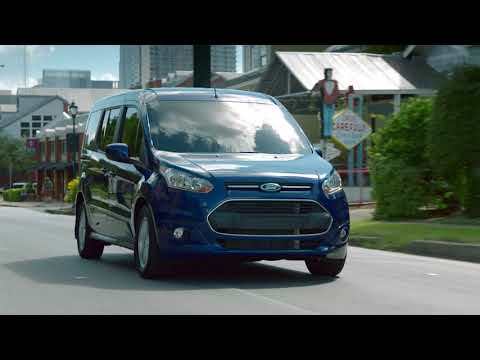 The 2018 Ford Transit Connect is comfortable, and the interior flexibility of the seven-seat version is impressive. The 2018 Ford Transit Connect offers remarkable comfort and a quiet, tight interior inside a commercial vehicle destined to haul tools, supplies, packages, and other cargo. The front cabin feels just like that of a compact car, but like the Ford Escape crossover, occupants sit several inches higher. With the raised roofline, there’s still more than a foot of head room above even taller drivers. Front seats are comfortable and supportive, but the two rows of back seats in the three-row passenger Wagon version is impressive. The second row is large enough to fit two adults, though three will find the Transit Connect narrower than a minivan. The 60/40-split second-row backrest flips forward, then the entire seat folds forward again and drops deep into the floor in one continuous motion. The pair of third-row seats slide a few inches back and forth, and also fold flat, with an extending shelf providing a flush cargo floor when they’re folded down. Loading and reconfiguring the Transit Connect Wagon is easier than in any other vehicle its size, due to the wide sliding doors on both sides and an enormous tailgate opening. There’s no step up into the car; the seats are at standard adult height. That’s because the little front-wheel-drive van rides at car height, without a rear axle to get in the way. The torsion-beam rear suspension eliminates the high liftover height of regular vans, which owners also find in most crossover utility vehicles with all-wheel drive. Ford offers a choice of twin side-hinged rear doors or a single-piece tailgate. Unless you have severe height constraints, we recommend the hatchback, which is out of the way when loading and lacks the central pillars that obstruct vision in the twin doors. The 2018 Ford Transit Connect comes with a minimum of six airbags, but hasn’t been tested by the IIHS. Even the two-seat commercial versions come with six airbags for driver and passenger, while the passenger models have two-row side airbags for the five-seat version and three-row side curtains when the longer-wheelbase model with seven seats is specified. A rearview camera is optional on XLT versions of both the cargo van and passenger models. The 2018 Ford Transit Connect offers numerous car-like options, though it’s still short on any active-safety features. The 2018 Ford Transit Connect comes either as a commercial cargo van in two trim levels (XL and XLT), or as a five- or seven-passenger Transit Connect Wagon model in three trims, with a top-level Titanium version for the seven-passenger Wagon only. That seven-passenger passenger version rides on a longer wheelbase; both wheelbases and a variety of rear-body styles and configurations are available for the very customizable cargo van. For 2018, Ford has added a few upgrades to each version, with a rearview camera and the Sync 3 voice-activated infotainment system with its 6.5-inch touchscreen now optional on the XLT trims of both versions. All models include power front-door windows and keyless entry. The XLT adds heated power mirrors, Ford’s MyKey individualized vehicle settings, standard cruise control, and automatic headlights on the passenger versions. The high-end Titanium level for the seven-passenger Wagon includes dual-zone automatic climate control and standard leather seats. Available options include remote starting, and for the Wagon, a panoramic sunroof and an optional roof rack. One downside to the passenger versions is a complete lack of active-safety features, from adaptive cruise control to lane control or even blind-spot warnings. Even a rearview camera remains optional. Only five years ago, those features were offered mostly by high-end luxury cars; now, various combinations are standard in even modestly priced economy cars. They’re likely a growing concern for family-oriented buyers, and the Transit Connect Wagon falls down in that regard. One final note: the standard cloth upholstery is breathable, comfortable, and likely far more practical—even in a family Wagon—than the leather (optional on the XLT, standard on the Titanium). The 2018 Ford Transit Connect, in cargo or passenger versions, offers better fuel economy than full-size vans. The commercial van version of the Transit Connect is EPA-rated at 20 mpg city, 27 highway, 23 combined, while the Transit Connect Wagon passenger version comes in at 19/27/22 mpg. That latter rating applies to both standard and long-wheelbase Wagons, by the way. The Transit Connect has been fitted to accept E85 ethanol fuel, making it a Flex-Fuel Vehicle, though as usual fuel economy falls drastically on E85 due to its lower energy content per gallon. Commercial users can also order versions modified to accept aftermarket natural-gas and LPG fuel. With continuing cheap gasoline, those versions are less likely to be attractive than in earlier years. Looking for a different year of the Ford Transit Connect?